Giving employees frequent recognition helps drive engagement and boosts morale. Whether the recognition comes from your peer or your manager it builds bonds, turning a company filled with employees into a community filled with friends and colleagues. With the introduction of Social Recognition platforms, companies now have a tool that can deliver recognition in a way employees want, understand and enjoy. 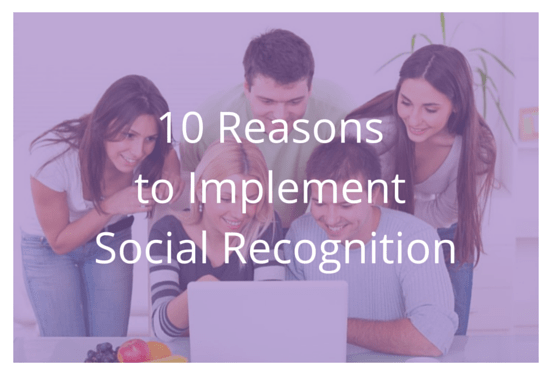 Here are 10 reasons why Social Recognition rocks! 1. In Ireland and the UK, smartphone use continues to rise. In Ireland, 75% of people own a smartphone. In the UK the figure is 66% – and 50% of those aged 55-64 years are users. 2. A recent Ofcom report (UK) suggests we spend two hours/day on our smartphones. Superfast, mobile 4G is changing the way we shop, bank, watch TV and communicate. 3. Millennials will make up 50% of the workforce by the end of the decade. They are digital natives, comfortable with technology: they are connected, transient and expect instant access. They expect sincere recognition and instant feedback. 4. Social Recognition combines the best communications features of social media with the ability to send meaningful peer-to-peer and manager-to-peer recognition. Social Recognition solutions offer an interface that is familiar to the user. 5. These Social Recognition solutions allow your company to model best behaviour by encouraging employees to recognise one another, based on company cultural values. 6. Social Recognition makes recognition transparent: everyone in your company can see who gives and receives recognition. 7. Social Recognition democratises recognition as the same platform is used by all members of your workforce – from the production floor to the boardroom. 8. The nature of a Social Recognition platform encourages high recognition frequency and unlimited recipients. 9. Social Recognition can connect all members of a company: they can see and celebrate what is happening in the wider organisation – this builds your company into a community. 10. Social Recognition can be linked to Rewards which can further boost performance and build loyalty to your company. We have to communicate using peoples’ preferred means of communications. Today, this means using digital tools. But this is not enough: the content must also be engaging in order to encourage participation. A Social Recognition platform, accessible via mobile devices, allows employees to send and receive messages of recognition on a timely basis, in a transparent manner. This helps you to get their attention – so they buy into your company culture.